Prior to European settlement of the West, fires played an active role in landscape management, with low-intensity surface burns that purged the forest floor of fallen branches, leaf litter and understory growth. The prairies of the United States were once sparsely forested, and fire acted to regulate succession, allowing for a mosaic of plant communities supporting large and diverse animal populations, as well as native American peoples, whose settlements were relatively transient. In the early 1900s, as more United States citizens began to settle in the Western states, fire was seen as a nuisance and a threat. In 1910, after a series of severe wildfires ravaged the Northwest, the National Forestry Service adopted a “fire-suppression” policy, in which any fire lasting more than 10 hours was to be immediately extinguished. Intended to protect property, save lives, and ensure the preservation of the forests, this strategy has in fact had grave consequences. By quarantining flare-ups, the 1910 fire suppression policy leaves the rest of the forest untouched, allowing the accumulation of saplings and undergrowth that would formerly have been removed by periodic burning. By the end of the 20th century, fire-prone vegetation has quadrupled in many of our national forests, overwhelming firefighting efforts and resources when the yearly fire calendar takes effect. As population has increased in fire-prone lands, forests have been relegated to a protected status where they are maintained by state and federal forestry bureaus. Human presence in these zones is frequently characterized by suburban development: low density, high surface-area land occupation. What results is a dichotomous relationship in which human habitation and vegetated landscape are separate entities; suburban development proliferates freely, and “protected” forest systems are suppressed and kept outside the daily consciousness of local residents. It is not until a catastrophic wildfire event that the two entities are actively pitted against one another. The fringes of these developments often sit as “standing reserves,” where housing abuts forested land that is poised for future development. These fringe communities increase the likelihood of fire in already highly flammable WUIs. Simply put, increased development in these areas creates a giant tinderbox in the West. The proposal aims to synthesize forestry strategies, revised construction methods, and safe prescribed burning methods as design drivers. One major response to the wildfire dilemma is that we simply should not build in fire-prone environments. However, this attitude absolves human beings of any responsibility in transforming regular, low-intensity fires into unpredictable high-intensity wildfire disasters. The creation of wildland urban interface zones is increasingly common; as urban centers grow, so too do the peripheral suburban developments that have come to define sprawl. With overcrowded forests proving difficult to manage, fires become more violent and powerful, which increases destruction of houses and communities by wildfires. Designers have a critical challenge, and the opportunity to reverse a disastrous trend through strategic planning. The proposal calls for the integration of housing and forestry as a maintenance strategy. Acknowledging this reality, the Living with Fire proposal argues for increased human agency in planning fire-adapted communities that engineer a mutually beneficial relationship between human occupation and forested landscape; where forestry maintenance and increased development have the potential to both regulate fire patterns and yield a sustainable resource for growing communities. In this case, low-density, high surface area landscape occupation--deployed with deliberate intentions--has the potential to play an active role in landscape remediation. Rather than prioritizing the defense of the home, the proposal aims to reposition the home as a component of forestry maintenance and take advantage of service infrastructure for homes as a landscape maintenance armature. By situating residential development along new forestry maintenance routes, the suburban desire for access to landscape amenities could be satisfied while also implementing a framework for managing forest health and density. 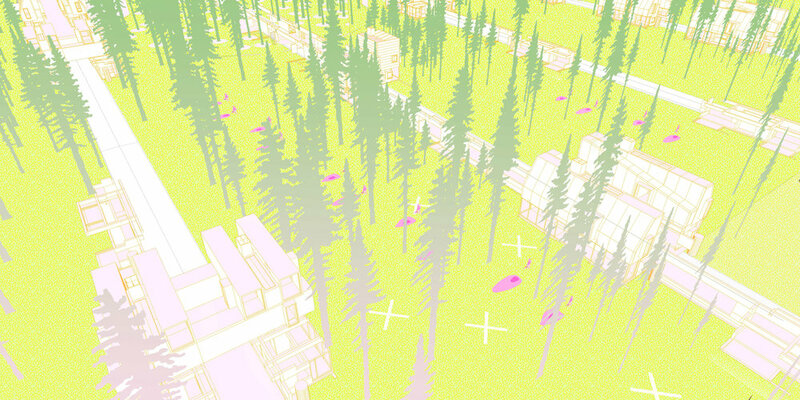 The resulting proposal projects an adaptation of the suburban model, one in which development is reconfigured as a territorial operation of landscape regeneration, and sprawl dwellers become auxiliary foresters. Cultivation of the pyro-active periphery proposes a gradient of housing and forestry ecosystems, where additive housing and subtractive forestry strategies are planned in tandem to cull and care for overly dense forests while establishing managerial settlements. 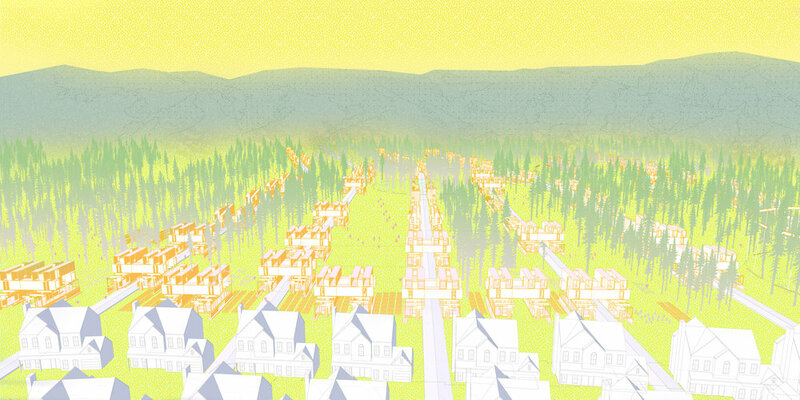 A phased proposal illustrates housing and forest integration at the new frontier. Drawing on the “shelterbelt” precedent of the Dust Bowl era, (where strategic tree planting in the Midwest protected agricultural land from wind erosion) this proposal uses deciduous tree corridors as the first tool for mitigating fire-spreading winds. Windbreaks extend into existing forests, where “variable retention” forestry operations are performed. In contrast to clear-cutting tactics typically employed for residential development, variable retention forestry utilizes a selection system of tree clearing, where specified percentages of forests are either thinned (partially harvested), skipped (no harvesting), or left as gaps (completely harvested). This technique is applied at a scale that preserves existing wildlife habitats and supports a cyclical harvesting strategy which in turn allows for time-sensitive development planning. Nursery planting beds are integrated with live-work lofts. Isolated, or cordoned off from human settlement, fire-adapted forests are difficult to monitor and manage. This scheme posits an integration of forest and suburban settlement, in which forests can be managed through cyclical harvesting and prescribed burning. As a generator of housing development form, the design exploits the existing Jefferson Grid as a logic for urban organization. The grid is then divided into a series of forestry maintenance lines which run perpendicular to prevailing summer winds. These strips serve as zones in which a new mixed-age forest (including sapling, adolescent, productive, and mature trees) is planted. Finally, prescribed burning corridors, which take advantage of prevailing wind direction, determine the safe subdividing of plots for housing. Successional forest and maintenance route integration. In contrast to typical suburbs, which strive to present a harmonious relationship with tame “natural” surroundings, the physical design of the pyro-active neighborhood is an aggressive reminder of the juxtaposition of artifice and “nature.” Employing regular tree thinning and harvesting, prescribed burning, and consolidation of housing and maintenance routes, the pyro-active neighborhood stresses cooperative maintenance of timber resources and community collaboration for ecological caretaking. Roads and home access run perpendicular to topography rather than artificially hugging engineered contours. These landscape lines organize the reimagined “hearth” of the community as an infrastructural track that minimizes ecological impact and guides future development. Typical suburban layering vs. the fire adapted dwelling. The fire adapted dwelling is a tight-fit kit-of-parts system rather than a traditional autonomous house. A robust Cross-Laminated-Timber prefabricated wall assembly attaches to an elaborate “hearth” network. This integrated assembly is a more fire-resistant timber construction method than the layered construction assembly championed by residential developers across the United States. The simplified house omits features such as complex roof forms (which trap flammable debris such as pine needles), and does away with stud-wall construction clad in the synthetic siding that is particularly prone to failure during exposure to high wildfire temperatures. With the “hearth” as the structural and spatial organizing anchor of the home, the domestic realm is reoriented about the communal energy source. Ian Carr is a 2016 Master of Architecture graduate from the University of Virginia. He holds a Bachelors of Environmental Design from the University of Colorado at Boulder.